San Diego is expecting a storm throughout the week so turn off the sprinklers and let mother nature do her job. While it’s great for the climate, I know one camper who won’t be so happy it- Jack. A rainy day for him, as I’m sure for many dogs means staying home. If it’s raining and I’m away at work, Jack’s subject to stay home because unfortunately his daycare Kamp Kanine http://www.kamp-kanine.com closes on rainy days due to its outdoor facility conditions. If I do get to stay home, that normally means I’ll be hacking away on the keyboard followed by a movie marathon in bed. It’s nice to have rainy days. There’s something about cuddling up inside on a rainy day that feels so serene. Sadly for Jack, a rainy day means being STUCK. INSIDE. ALL.DAY. with intervals of 2-3 short walk thrououth the day. 3 if skies clear up. A situation like this could drive a dog nuts. Luckily, there are several games I have found to be very useful to prevent him from getting cabin fever. Hopefully they can help you deal with your doggy as well. Hide and go seek is a perfect year-round game for dogs of all ages. 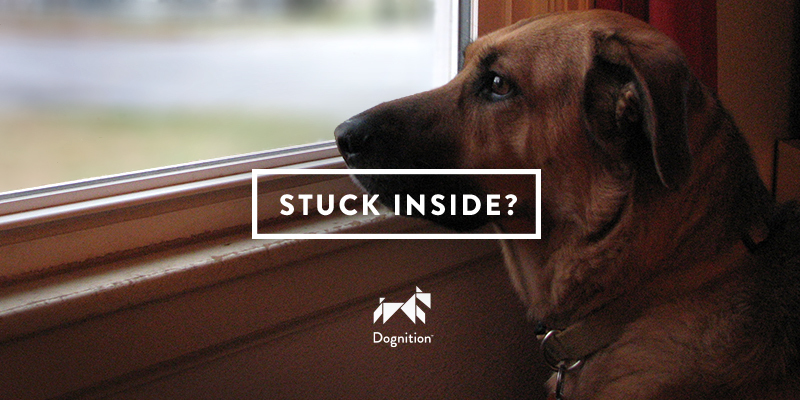 Not only does this game work perfectly on rainy days, but it heightens a dog’s sense of smell in a fun and rewarding manner. Start out with a few of your pooch’s favorite treats. This game will require two people initially. One person stays with Fido in a room while the other hides. When ready to be sought, the hider lets out a “come, Fido” or “whoo hoo” sound to initiate the game. As Fido scours room to room, occasionally let out a verbal signal. Once found, praise him like he just won an Olympic medal and reward with a treat. Repeat. One caveat: Be sure the favorite Limoges vase or grandma’s heirloom plates are removed first. Fido can’t fire up the PSP or Nintendo and play video games but he can engage in some good old-fashioned game play. However there are some games designed to exercise the brain. These activity toys encourage problem solving in a multitude of ways: finding hidden treats via lifting and pushing blocks, pushing pieces and turning discs. The Kong line of mind-stimulating toys fit the bill on a rainy day. Stuff treats inside the opening and Fido must problem solve to access the reward inside. Patience and persistence means puppy puddles of fun! Work on tricks and commands to exercise Fido’s brain and body. Do this for 10-20 minutes and Fido will be sure to get much needed physical and mental stimulation out. Tricks such as Sitting Up to beg for 10 reps will help strengthen your dog’s core muscles improving balance and stability. Those core muscles are used for walking, trotting, jumping and many other actions so it is important to strengthen them regularly. Rolling Over is another good exercise for core muscles. Do four to five rolls each direction so you are targeting muscles equally. Shaking Hands is a nice stretch for the shoulder muscles but be sure to do both front paws 5 to 10 reps for a balanced workout. Tug-of-War is without a doubt my #1 go to for tiring out Jack. He loves the game and I get a good arm toning up as well. A toy or rolled up towel work great. Tug of War strengthens the rear end, shoulders and abdomen of a dogs physique, so the game is beneficial too. When playing, be sure to remember not to lift the dog’s head and or neck back when playing tug of war. You don’t want to hurt them. For the majority of the game, I encourage you to let the tug favor fall in Fido’s hands as this will build his confidence, further engaging him in the game while stimulating his brain. If you have any indoor games ideas I have not mentioned please share! I could use all the suggestions I can get to tire out this beast. Have a wonderful weekend, stay dry! Previous Animal Planets Puppy Bowl XIII : Ruff Competition featuring shelter puppies from across America!